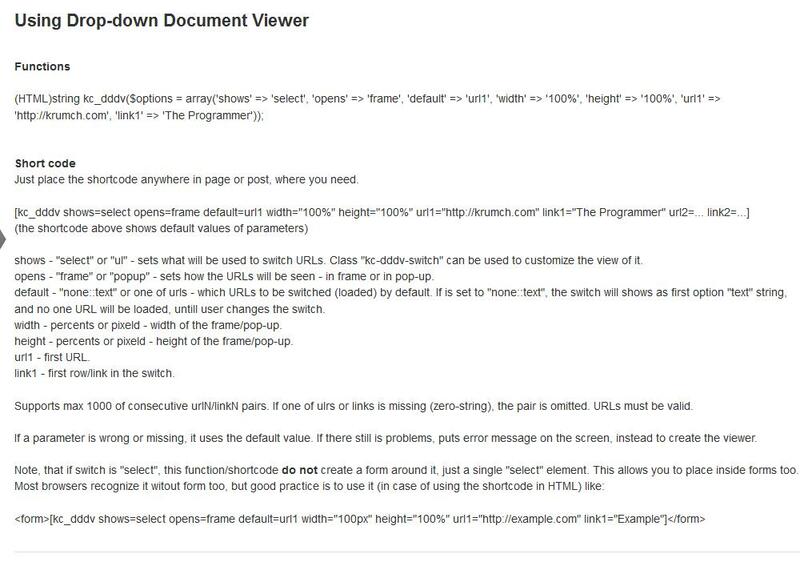 This WordPress plugin (short name - "KC DDDV") generates and inserts DynamicDrive's "Drop-down Document Viewer" (http://www.dynamicdrive.com/dynamicindex3/dropdownview2.htm) by short code, so can be used anywhere. You can specify a list with sites (URLs and links) to be shown in a frame on page, or in pop-up. Can use both as WP shortcode or PHP function. Generates HTML code. Looks like this code does not works with some themes. If you find such problems, let me test, so I can fix it. Nothing special, just a generic installation. No settings needs. In admin area (adds new row "Settings-> KC DDDV") you will find just usage instructions. Ask me, I will answer. Contact me. This entry was posted in WordPress plugins and tagged Document Viewer, Drop-down Document Viewer, DynamicDrive, frame, function, generate, generates, iframe, insert, KC DDDV, list, pop-up, popup, short code, Viewer, WordPress, WordPress plugin. Bookmark the permalink.